"INTUITIVE YOGA REVEALS, WHAT'S INSIDE. TRUE YOGA BEGINS IN THE HEART." feel the energy flow and breathe with awareness." "Consciously be aware of the moment between the expansion and contraction of the tissue. Sense this space, breathe into this space and the pattern will transform." "When I was asked to do the shooting of the Intuitive Yoga Retreat on the island Schwanenwerder in Berlin, I had to confess, that I never tried a yoga posture in my life before. And I didn't have time to try it out during the production either. But I could feel the effect in the group and how the participants interacted with me. There was so much warmth and empathy and it was growing more and more. How could that be possible? They were only practicing yoga ... The participants were breathing into their tight spaces, opened up to their inner process and began to build a deeper relationship with their own body. Even though I was exhausted from my work, I was filled with the atmosphere and harmony at the same time. During the post-production I became aware that there will be no perfect yoga studio atmosphere. Instead, we are proud to present a product that is authentic and inspiring and will bring you into the here and now." That's what makes the Intuitive Yoga Online Retreat so special. You meet a wonderful group of like minded people under the guidance of a beautiful teacher, who teaches intuitively, playfully and passionately. When watching the videos, you feel as if you were part of the yoga retreat, in nature, by the lake and surrounded by majestic ancient trees. With these videos you bring the summer to your yoga mat, whether in the room, on the veranda or in your garden. When practicing the exercises, your stress level decreases, you feel more relaxed and become more conscious of your body posture, which brings you in touch with your inner strength. Your muscles get toned and you will be fit and active. Your flexibility increases dramatically and your concentration level improves. You learn to listen to your body and energy flow. You notice your inner space and become consciously aware of your innate stillness. The meditation techniques, breathing techniques and exercises help you to find your inner balance. You experience well known and trusted exercises in a new way. Intuitive Yoga allows you to be playful with asanas that correspond to the elements of ether, air, fire, water and earth. You experience healing of body, mind and spirit and will have your own individual spiritual “Aha’s”. The five-element-breathing techniques can be incorporated into any session, to support, stabilize and balance a client. Intuitive Yoga includes Hatha Yoga, Polarity-Yoga, Meditation and the Universal Principles as taught in Polarity, whether through the breath or exercises. 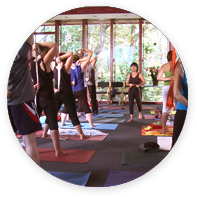 As a teacher you can integrate Intuitive Yoga into your existing Yoga courses playfully and with ease. 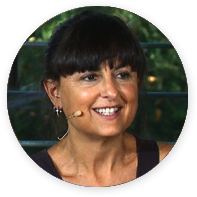 The Live Recording of the Intuitive Yoga Retreat with Eleanora Lipton as an Online-Video-Course. There are many hours to practice, meditate, learn and experiment. The course is divided into 30 Videos and structured into different groups and themes. This way it is easy for you to navigate your way through the various videos. Depending on your interest and priorities you can choose and combine them to your heart’s content. "The place itself was already enough to open our hearts. The morning meditations lead by Eleanora added to that. During the Intuitive Yoga-Retreat she opened numerous possibilities to be with our body in gentle and loving ways. I was very impressed and found it helpful to dissolve a blockage or pain through mindful inhalations and exhalations. “I experience Intuitive Yoga (IY) as an embodiment of Polarity Therapy. Eleanora’s humility touched me deeply. I experience a woman, who practices the polarity principles in such a holistic way in so many situations in her life. "Eleanora is a great teacher and very inspiring. The days in Berlin was a place to catch energy and inspiration, a space to meet new friends and build networks." "The Yoga-Retreat was a real win for me personally and for my own classes. I really liked the community spirit and I felt very comfortable. The venue - pure nature – was perfect." "Everything that happened was placed in the bigger picture and connected to the divine spark inside us, with one goal in mind, to realize the evolution of our soul in this world. – With our body as an indicator with its energies and reactions – as, according to Eleanora: „The body never lies“. "Even though the method of yoga I learned in a beginner’s class before was pretty strict, Eleanora’s approach is soft and playful and inspires me. „Back up“, if it’s too difficult. „Find the opening in every human being”, she calls it another time. (Hm, this is also the way in Polarity!)" ... lives in Berlin. 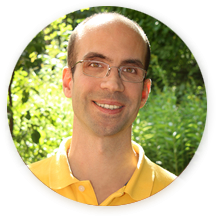 He is a raw food vegetarian, studied medicine and is a fully trained dietitian. He is a film producer for everything that has to do with nutrition, health and nature. He was responsible for the shooting of the Intuitive Yoga Retreat. He worked alongside with Gisela Kissing to do the post-production, product design and marketing in both languages. The PVD e.V. 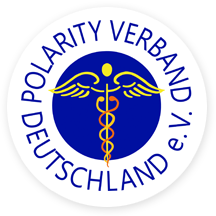 represents German Practitioners and Teachers of Polarity Therapy. Interest in Polarity is raised through various products, workshops and trainings. Their courses are valued internationally. Polarity is an integral health building concept with energetic bodywork, practiced by Naturopaths, Doctors, Psychologists and Alternative Health Practitioners alike. Gisela Kissing was the president of the PVD e.V. for five years and was responsible for the invitation and organization of the Intuitive Yoga Retreat. She structured the contents and directed the post-production, did the product design and marketing in both languages together with Mark Weiland. 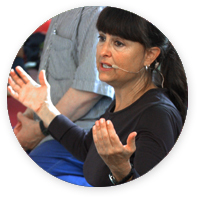 Eleanora Lipton is the founder of Intuitive Yoga, with over 30 years of experience in Polarity Therapy, Hatha Yoga und Meditation. 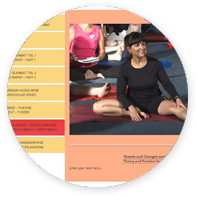 She teaches Yoga-Retreats in the USA and inter- nationally and offers private sessions. Eleanora teaches Intuitive Yoga successfully at the „Accelerated Re- covery Center“ for alcohol addiction and drug dependency. 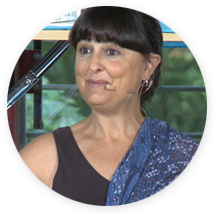 She is director of the Atlanta Polarity & Intuitive Yoga Center, Polarity teacher and a member of the American Polarity Therapy Association APTA and the International Polarity Education Alliance (IPEA). „Energy is the real substance behind matter and visible form." "Health is not merely of the body, it is the unity of all life." "It is the energy in matter, which brings matter alive." "... any exercise is good which keeps the shoulders free and movable, and assists in respiration and digestion." Long long time ago…my life journey began with my first yoga class in 1973. Something deep clicked inside of me. I could feel my body in a new and richer way. Over time and years of practice, accompanied by spiritual practices of meditation and study, I could feel the direction of my life changing in a way that slowly began to make more sense. The different parts of me were pulling me in different directions, i.e., continue pursuing my dance career and keep struggling to effect environmental politics OR follow all my studies in health and healing. I chose the path that felt to be the most positive for my body, heart and soul. This all came together when I began Polarity Therapy in 1980. I knew I had found a large enough basket in which I could put all I'd developed and more. I know the path of healing is profoundly needed in the world and in my life. Following the shocking death of my fiancé in 2000, I was faced with putting my work to the test more than ever. I could barely do yoga due to the flood of emotions that would arise out of my body and into my awareness. And what a profound proving to myself of the power of yoga. This was not easy. I knew then on a whole new level, how yoga cleanses and clears the body/mind on every level. When the mind and emotions get clear, the body is free. I experienced an incredible emptiness, in a strange yet comfortable way. Over time i felt lighter and lighter, I think this whole process began to open my Light body. My energy was surprisingly strong and life began to turn around for the better. Now, 2016, the journey simply continues and feels more pressing than ever. Life is always about riding the waves. The stronger the surfboard of support and knowledge, the better we ride! Based on my personal experience, and working with so many people over the years and to this day…..I truly know the power of polarity therapy in all its forms. Intuitive Yoga just hit me as the true expression of energy principles in movement, breath, and meditation. 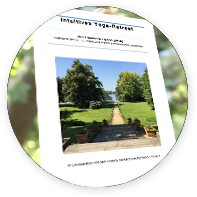 Order the "Intuitive Yoga Online Retreat with Eleanora Lipton" now! Over 17 hours of Intuitive Yoga with theory, demos, pratice, tutorials and interviews, including a script, music and numerous practical tips. You can get started right away . How long do you have access to the online videos? Compared to the live event, they are available unlimited and can be watched online anywhere: now – in a years time – or later. No download of the videos is necessary. After purchasing the product, you will receive an email with your personal login information. After login you have access to the videos, interviews and bonus content. It does not feel good to receive money from you, when you aren’t happy with what you get. If, after you have access to the course and you aren’t happy with what we’re offering – for any reason whatsoever – let us know. we’ll refund your payment. Ask in the first 30 days of your purchase – and we’ll refund 100% of the money you paid for the Online-Video Course. you will gift someone with a Morning- Meditation with Easy Stretches from the course who can use it. we’ll ask you to pass the link to this video on to a friend, colleague, in-law, or someone you think might like it and would benefit from this Intuitive Yoga teaching. It’s Karma-Free: You get your money back and you get to be generous and benefit others. Plus, if you let us know what you didn’t like about it, we’ll give you a recommendation for a book, author, website, or other resource that might suit you much better. We are really wanting you to get the benefits you need, no matter where it comes from.